Microsoft today announced the next generation of its Office suite: Microsoft Office 2013, the desktop version, and Office 365, a subscription-based version of the same product that comes with more frequent updates and tight integration with SkyDrive, Microsoft's cloud service for document storage. The suite includes new versions of Microsoft Word, Excel, Outlook, PowerPoint, OneNote, and a few other applications, all of which have been redesigned and, thankfully, look much smarter. 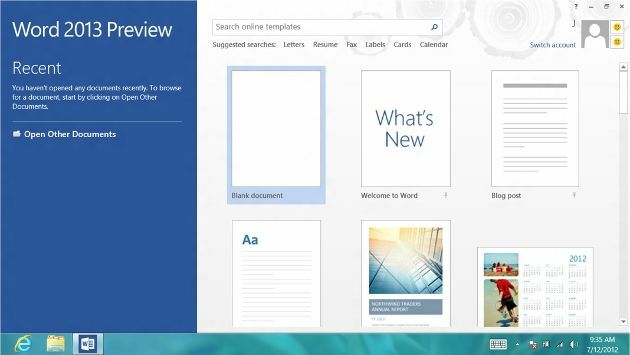 The biggest changes implemented in Office 2013 are that it integrates with SkyDrive and works across a multitude of devices. The new Office works on PCs and tablets running Windows 8, as well as Windows Phones. Microsoft has not yet announced when the software will be available for purchase, nor what it will cost. A Mac version will be available at launch as well, according to company representatives. PCMag received an early preview copy of Office 365, running on a Samsung Series 7 Slate with the Windows 8 operating system to get a feel for the new apps. First impressions don't come with second chances, and, luckily for Microsoft, the new Office looks much smarter than its predecessors. All the apps have a more streamlined appearance, particularly because menu bars and other options collapse neatly when you don't need them. 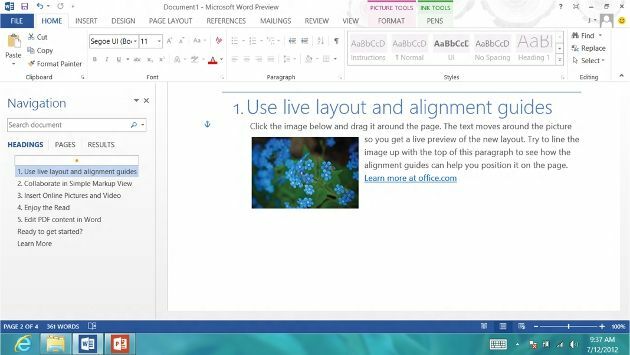 Microsoft Word and PowerPoint in particular, go to much greater lengths to help you focus on your text or slides without dozens of distracting buttons that you weren't planning to use anyway. Fewer color gradations and more right angles (rather than beveled edges) in menu bars also contribute to the modernized look. 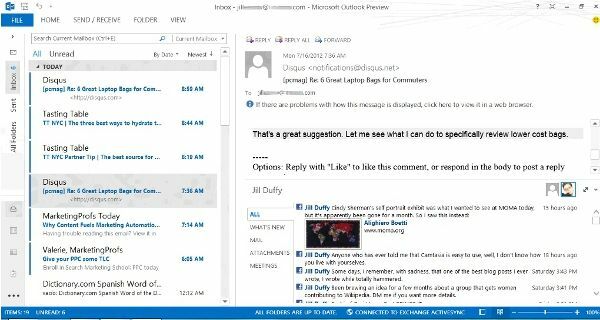 Outlook looks so drastically different, you might mistake it for Web mail. Setting up the preview copy of Microsoft Office 365 (again, that's the name of the subscription-based service, while Office 2013 is the locally installed desktop version) requires signing into a Windows Live account, which authenticates the connection between the apps and your SkyDrive account. SkyDrive is Microsoft's own cloud storage solution, similar in many ways to Google Docs (which is in the process of being expanded and rebranded as Google Drive). 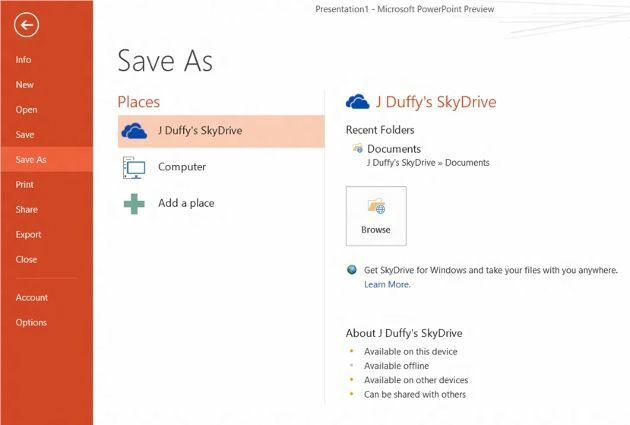 With SkyDrive, you can upload documents to your Web account so that you have access to them from any Internet-connected device. And like Google Docs, SkyDrive has Web versions of some common apps, like Word, Excel, and PowerPoint. 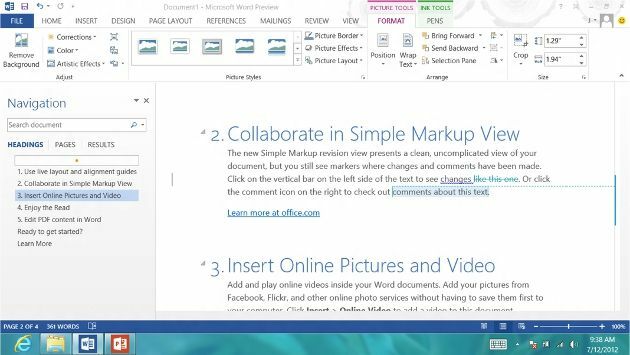 So if you're on a computer that doesn't have Microsoft Word installed, you can still read and edit your Word documents—provided you've saved them to SkyDrive—as well as create new Word docs. The 2013 version of Microsoft Office integrates much more tightly with SkyDrive. SkyDrive becomes the default location for saving new files, though you always have the opportunity to override the suggestion and save your files where ever you want. The option to save files locally rather than to SkyDrive is the kind of thing that some Windows users probably just assumed would be the case, but it's quite different than what Apple users have grown to expect. For example, if you use Apple's office apps, such as Pages or Numbers, to create a new document on an iPad, you never once have the ability to choose where to save the file. Apple automatically saves it to your Apple iCloud account (the nearest equivalent of Microsoft's SkyDrive). I was pleasantly surprised to be able to save files wherever I wanted on the Samsung Series 7 Slate tablet running Windows 8. Mac users working on a laptop or desktop have better ability to save files locally, even with the next Mac OS X 10.8 Mountain Lion, though integration with iCloud is still tight there. For each app, you can customize a subtle graphic design that decorates the upper right corner of the screen—I liked "straws" and "tree rings"—to give your apps a hint of personalization. As with any long-standing, standard-issue business software, Microsoft Office cannot change too radically from one version to the next. People rely on these apps for business, and too much change can throw off their ability to get work done. Remember the wrath longtime Office users unleashed when Microsoft forced The Ribbon on them? It's critical that Microsoft roll out new features, functionality, and other changes to Office carefully and strategically. With Office 2013 and Office 365, the additions are few but noteworthy, which was the right balance for Microsoft to strike in this release. Here are a few of my favorite new features. Like an unkempt bachelor who finally shaves and puts on a tie, Word cleans up nicely. The biggest and brightest change to Microsoft Word in 2013 is how spacious it has become. Word—and really all the apps in Office 365—has finally embraced whitespace. The ability to collapse menu bars and create a more focused writing environment is no small improvement. There's an entire subcategory of word-processing applications that cater to people who prefer to write in a distraction-free environment, without menu bars, macros, and other on-screen bells and whistles. Giving Word users this experience is somewhat overdue. Better yet, a new view option, called Read Mode, sets your document in an entirely distraction-free screen, leaving just the most essential buttons within easy reach at the top. It looks even more courageously sparse than the Full Screen Reading mode in older versions of Word. But even more monumental than Word's new look is one huge feature: You can now edit PDFs in Word. Yes. You read that correctly. Open a PDF in Microsoft Word, and you can type right into—not on top of—the existing text (see slide 9 in the slideshow). As long as the PDF was created with typed text, you can edit it. 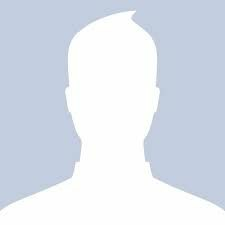 This feature doesn't work on PDFs that contain text that was created as an image, however, but the majority of forms and other PDFs that you would want to type on will be supported. New mark-up tools make editing and reading edited text a little easier, but without making any radical changes to the Track Changes feature set. Working with images is easier now, too, because you can drag them around and see a preview of how the text wrap changes in real-time. Another improvement on the image front: Word now lets you insert online pictures and videos. That means you can embed a YouTube clip right in your Word document. 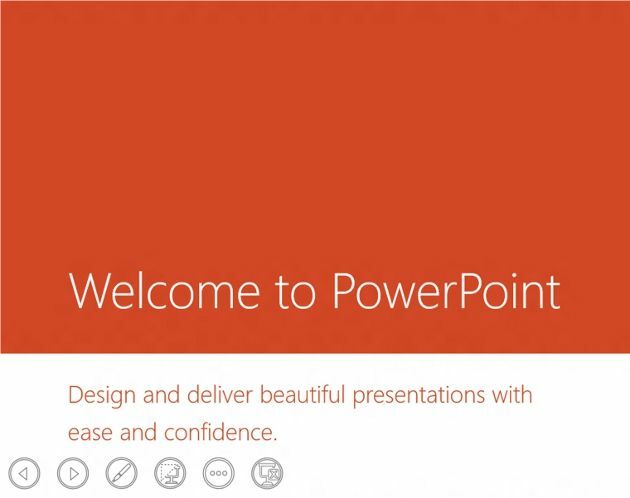 Start up the new PowerPoint 2013, and you're faced with a stockpile of updated themes that you can use to start your presentation. Built-in alignments and smart guides help non-designers keep their sloppiness in check. When building presentations as a team, PowerPoint now does a much better job of enabling collaborative editing. Save a PPT to the cloud, and you'll be able to send a link to the file, where others can edit it. A new comments pane lets other discuss the work without changing it, too. 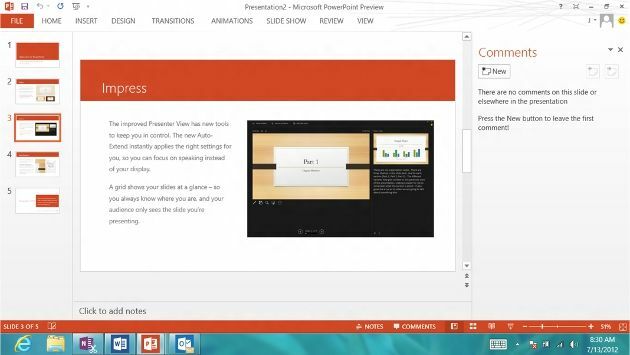 Tools that help presenters with the last stage of their jobs look very compelling so far in the preview edition of PowerPoint 2013. I love that the presenter can now zoom in on a diagram, chart, or graphic in the slide on the spot, during the presentation. Similar to Word 2013, another thing to highlight about PowerPoint 2013 is you can collapsible nearly everything, giving you a much more focused and distraction-free workspace. Better, when you preview your slides in full screen, quick access buttons appear over the images when you move the cursor, letting you quickly get back to work editing when you find you need to change your presentation. Visit page two to read about Excel 2013, Outlook 2013, and more! Excel 2013, like the other apps mentioned so far, simply looks better and cleaner. But number crunchers will be happy to learn about a couple of nice automations that make it easier to get Excel to do what you always wanted it to do. Flash Fill, for example, is a feature that helps Excel recognize repeated tasks or other patterns and finish them for you. 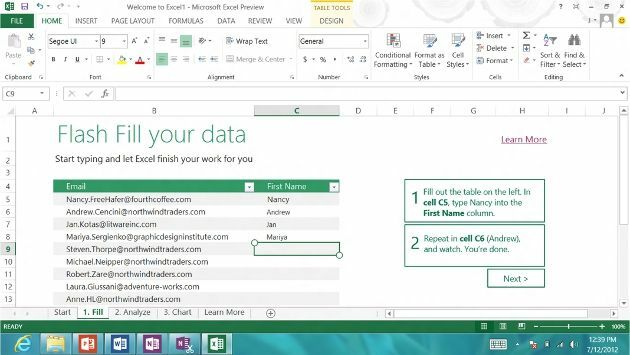 The example Microsoft includes with the new Excel 2013 as a primer is to have a list of email addresses in one column, to which you type into the next column the first name associated with each address. When Excel picks up on the pattern, it fills in the rest of the column. 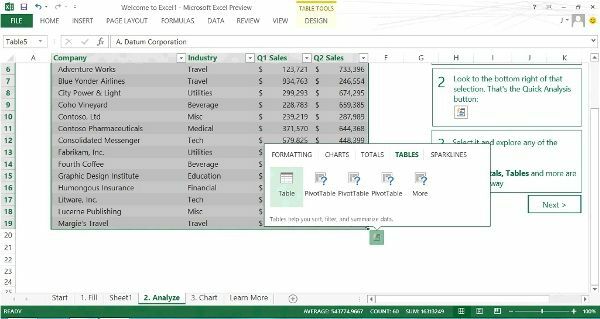 Excel makes other smart recommendations with Pivot Tables, too. Highlight any table, and you can see how it will look in a variety of tables that use different pivots, helping you pick the one that works. A recommended charts button similarly analyzes your data at a glance to suggest a few different bar graphs, line graphs, and other data representations that might best capture the point of your data. 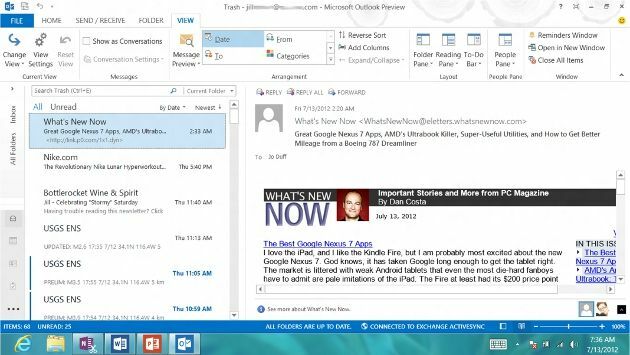 Outlook finally looks more like all the other email programs most people use—that is to say, Web mail. An interesting twist of a feature for this formerly rather button-up email app is that you can now integrate social networks, like Facebook and LinkedIn, directly into your Outlook screen. More importantly, you can integrate other email accounts, too, making your Outlook work more like email on a smartphone. The big idea with the new integrations is to make Outlook a new kind of communication tool in its own right, the same way other Web mail apps have. Take Gmail as an example, which embeds within the main program instant messaging and Google Voice. 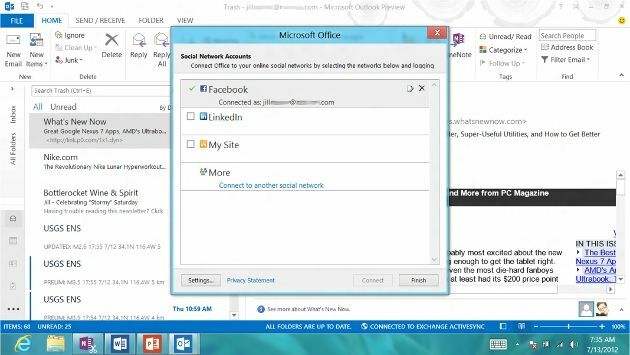 Connecting your Facebook or LinkedIn account to Outlook in Office 365 or Office 2013 gives you a space within the window that lets you see a snapshot of activity happening on those other social networks. When I integrated my Facebook account, a mini menu bar let me navigate among What's New, Mail, Attachments, Meetings, and All activity. Authenticating with a social network also allows for better contact synchronization because you can often find more information about a contact, such alternative email addresses and profile photos. While some may see this new social media integration option as distracting, anyone who uses social media as a primary part of their work or as a means to communicate with business partners will immediately know why Microsoft took this step. (We may call it "social networking," but sometimes, it's really just old-fashioned business networking.) Many other communication apps aggregate from a multitude of sources. These social media and mail aggregators can take your Facebook email, Twitter direct messages, and LinkedIn requests and stick them in one single inbox. This centralization is an extremely powerful ability, for those who will make use of it. It may seem like a minor change, but when you hit "reply" to a message that's previewed on your screen, the new message replaces the preview, so you no longer have to pop open messages to get back to people, saving you a couple of clicks per message, but perhaps thousands of clicks over the course of a few weeks. Another time saver is "peeking" or the ability to peek at your schedule, a specific appointment, or details about the person you're emailing, without flipping into the full calendar view or otherwise leaving the work you're trying to get accomplish behind. 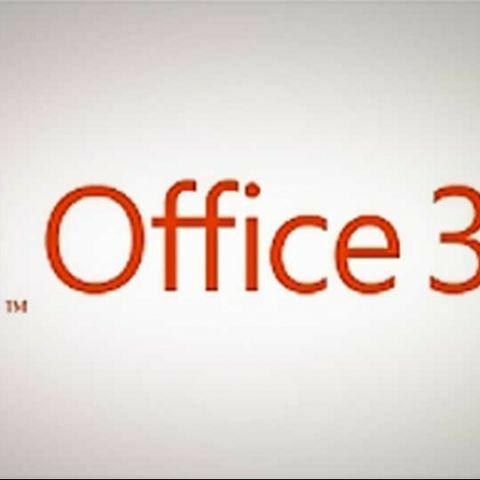 Microsoft has made a concerted effort with Office 365 and Office 2013 to include some of the best features of modern software and online services, like free cloud-based storage and social-networking integration. It's also gone a long way to update the design in a way that speaks to the things we value in modern software, like simplicity and a sense of openness, embodied primarily in the increased use of white space. I like what I see in the new Office, and if we've learned anything about the consumerization of IT, it's actually really important for employees to like their software. Office 2013 may be the first incarnation of Office in a long while that could actually grow on me the more I use it. Microsoft Office 365 (2013) : Word - This early look at Microsoft Office 2013 shows the homescreen for Word, running on a Samsung Series 7 Slate tablet. Microsoft Office 365 (2013) : Excel - Excel in Microsoft Office 2013 shows plenty of interface improvements, as do the other applications, and a few new features as well. 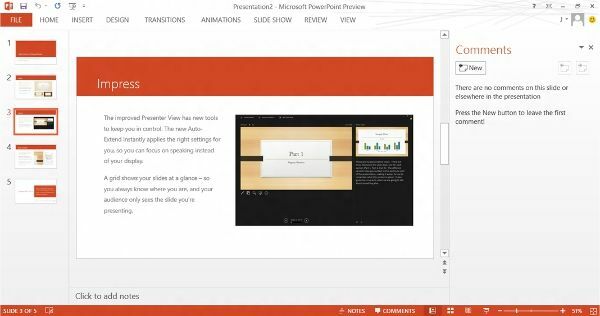 Microsoft Office 365 (2013) : PowerPoint - In this early look at PowerPoint in Microsoft Office 2013, you can see that the menu bars now collapse neatly to increase the screen space dedicated to your slides as you work on them. Microsoft Office 365 (2013) - One of the new features in Word is live layout and alignment, which shows a real-time preview of image placement as you drag the object around the screen and futz with the text wrapping. 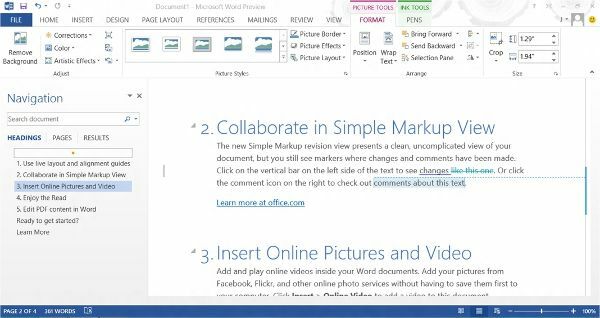 Microsoft Office 365 (2013) - Some changes to the Track Changes features make collaborative editing a little more streamlined. 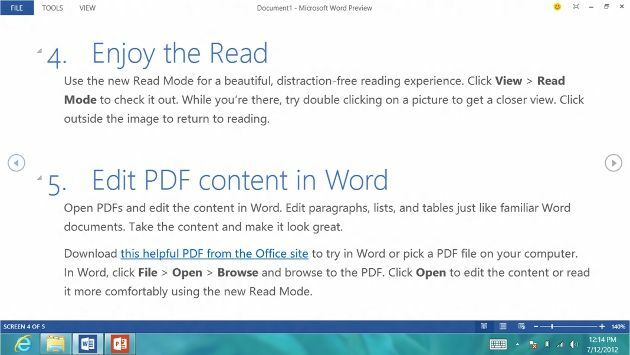 Microsoft Office 365 (2013) - A new Read Mode view lets you read Word pages with fewer distractions by hiding the various menu bars. 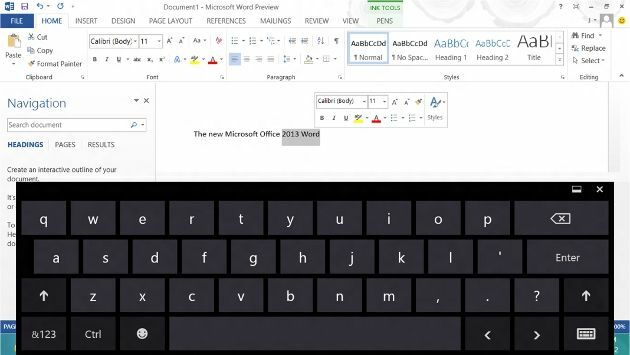 Microsoft Office 365 (2013) - Here's how Word in Microsoft Office 2013 appears when running on a tablet and the virtual keyboard is engaged. 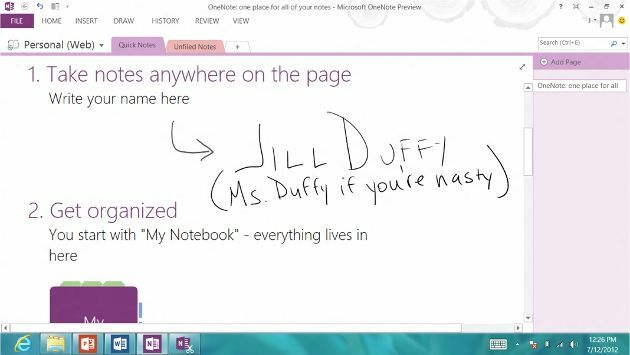 Microsoft Office 365 (2013) : OneNote - OneNote in Microsoft Office 2013 lets you take notes anywhere on the page, which is handy when you run the app on a tablet and want to quickly jot down an idea with a stylus or your fingertip. 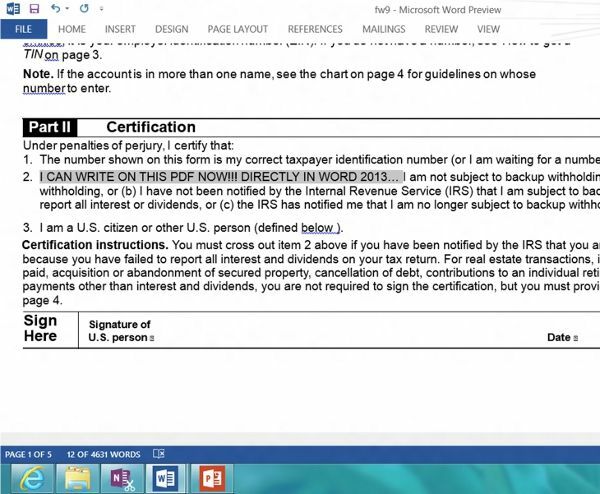 Microsoft Office 365 (2013) The most monumental new feature in Word is that you can now type directly into PDFs. 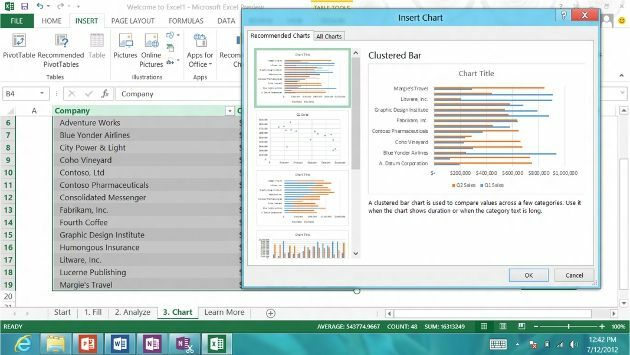 Microsoft Office 365 (2013) - A new feature in Excel in Microsoft Office 2013 enables the program to suggest charts for you based on your table's data. Microsoft Office 365 (2013) - This preview of Outlook in Microsoft Office 2013 shows the home screen, where you can find a few basic buttons, including saving and exporting, as well as connecting social media accounts to Outlook. Microsoft Office 365 (2013) - Outlook for Microsoft Office 2013 lets you incorporate Facebook, LinkedIn, My Site, and other social networks. 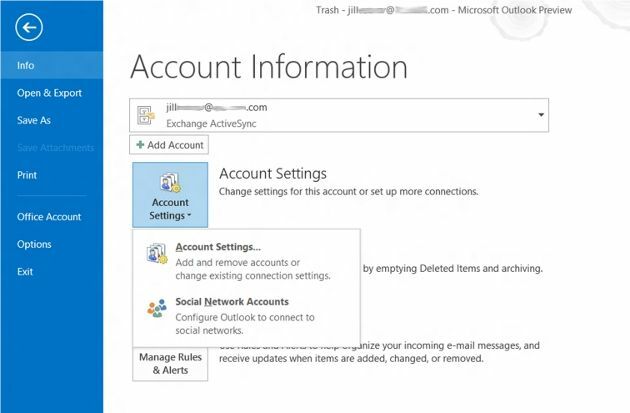 Microsoft Office 365 (2013) - This screen shot shows the central mail interface for Outlook in Microsoft Office 2013. 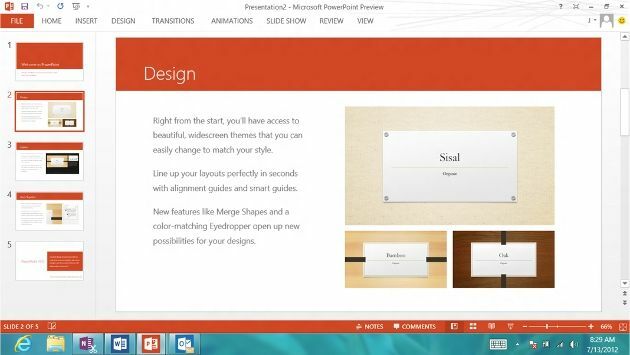 Microsoft Office 365 (2013) - In this home screen view of PowerPoint, you can see similarities between it and the home screens of Word, Outlook, and the other Microsoft Office 2013 apps. Microsoft Office 365 (2013) - Here is how PowerPoint looks when the comments and notes fields are open. But you can hide them, and other screen elements, to focus on your slides. Microsoft Office 365 (2013) - When previewing PowerPoint presentation, you can toggle open a few essential tools that you might need, shown in circles at the bottom, by moving the cursor.